Mark this down: I found a use for all of the math classes I endured through elementary, middle, and high school. (Thankfully I was finished with math and didn’t need anything besides an aptly named “Math for Elementary Education” for my college major which was fun and about as easy as it sounds like it should be.) And I took a page out of the book of my mathematically/engineering-minded husband, Seth. When he hangs pictures, he actually measures. Like with a real measuring tape and uses a level to make sure it’s straight. I use the “artistic method.” Meaning that I eyeball it, nail up the picture and then usually have to do this 2-3 times before getting it right. The patching needed after a few of my picture-hanging sessions is no small thing. And so this morning, while I was hanging up the beautiful prints, I took the time to measure the wall; figure out how to evenly space the five small prints; determine the height of each frame; mark it with a pencil before I made a nail hole in the wall. The result? 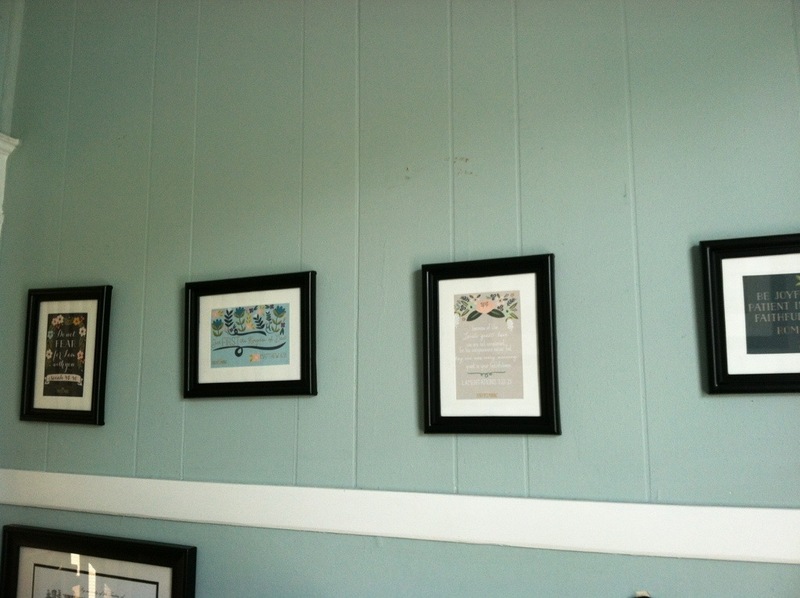 These pictures are beautifully spaced and aesthetically pleasing to even the most OCD of my family members (guess who). I think I might have enough energy and motivation now to tackle the piles on my desk so that I can actually use my office.